How many times have you reached mindlessly into a bag of mediocre tortilla chips, shoveling one after another into your mouth? Those fried crisps are loaded with fat, calories, and sodium that adds up fast! Why do that when it’s quick and easy to make your own healthy chips with actual corn tortillas?! 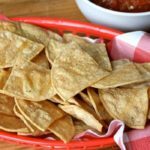 These baked corn tortilla chips taste fresh and have a satisfying crunch you’ll love, without the guilt. Dress them up with a squeeze of fresh lime, serve with salsa or this seven-layer dip, or make these healthy nachos. Prepare your own homemade chips without frying them. These authentic, Baked Tortilla Chips have satisfying crunch you'll love without the added calories. Lightly coat both sides of tortillas with spray. Arrange in a single layer on two baking sheets. Bake for 10 to 15 minutes, or until crisp. An FFC to enjoy with lunch or as part of a snacktional.